Hi! 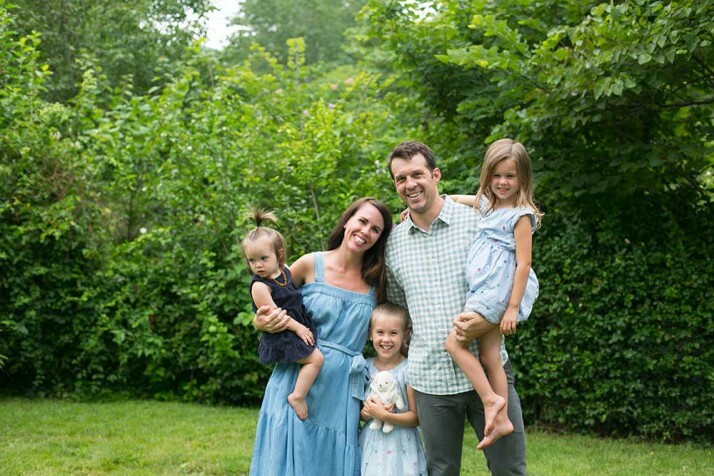 We’re Jay Senter and Julia Westhoff, a couple who live in Prairie Village with our three daughters. In 2009, we were serving as Peace Corps volunteers in Panama when we found out Julia was pregnant with our first kiddo. It didn’t take us long to decide where we wanted to put down roots: With its great public schools, charming housing and strong sense of community, Jay’s native Johnson County was an obvious place to start raising a family. We moved to PV and bought our first home in August 2009. As we got settled into life here, we discovered it was pretty difficult to find out what was going on in northeast Johnson County. The local newspapers had drastically cut back on coverage of city government, Shawnee Mission schools and local business. We met working for our college newspaper in Madison, Wis.
A shared love of journalism is one of the things that brought us together. Julia served as the editor of her high school paper in St. Paul, Minn., and Jay was the editor of the Harbinger after learning the fundamentals of the trade from longtime SM East teacher Bob Dillon. We met while working at our college newspaper, The Badger Herald, in Madison, Wis. So when we saw the lack of coverage for our community, we decided to start producing it ourselves. In 2010, we launched what was then called the Prairie Village Post, northeast Johnson County’s first hyperlocal news site. It’s a family affair. Here’s Olivia at age 7 taking photos at one of our candidate forums. In 2012, co-publisher Dan Blom, a veteran of nearly three decades in the newspaper industry, joined the team, and helped turn the fledgling publication into the most turned-to source for community news in northeast Johnson County. (Unfortunately for us — but much deserved for him — Dan retired at the end of 2017, though he continues to serve as an adviser). With Dan’s help growing the business, Jay was able to start working on the site full time in 2014. In 2017, we expanded the coverage footprint of the site to include the entire Shawnee Mission School District, with its 14 cities and more than 228,000 residents. At that point, Julia joined the operation full time as well, taking over management of our sales and subscriptions. Today, the Shawnee Mission Post is not only the most successful news start-up in Johnson County, but also a model for other community news websites across the country. One of the things that sets the Shawnee Mission Post apart from hundreds of other community news websites across the country is our readers’ significant financial support of our work through digital subscriptions. To get full access to all of the new and archived stories on the site, you can subscribe today by clicking here.